After a slow start, the country-house market in Somerset has finally taken off with the launch onto the market of some of the county’s most appealing Georgian houses. One of the most intriguing is historic Somerton Randle at Somerton-ancient capital of Wessex and the town that gave the county its name-which, for now, is being offered privately through Strutt & Parker (020-7629 7282) at a guide price of £5.75 million. And although the present house dates from the late 1700s, the origins of the manor itself, known previously as Somerton Erleigh, are much older, dating back to medieval times. In the late 1500s, the lease of Somerton Randolph or Randle was acquired by John Still, Bishop of Bath and Wells, who later bought the freehold. In 1657, his descendant, John Still of Shaftesbury, leased more lands from the owners of Somerton Erleigh and, five years later, sold the whole estate to John Howe of Berwick St Leonard, Wiltshire. By the 1780s, when his descendant William Howe (de Erleigh) sold the manor to John Pretor Pinney, the estate consisted of ‘a house and pleasure grounds with some 40 acres of surrounding land, and a farm of 49 acres’. John Pretor Pinney was the enterprising descendant of Azariah Pinney, who was thrown out of Somerset in 1685 for taking part in the Monmouth uprising, and went to Nevis, West Indies, where he started a sugar plantation. Some 80 years later, John Pretor Pinney inherited the plantation and went to live there, returning in 1783 to Bristol, where he set himself up as a sugar merchant. By the time he died in 1818, he had amassed a vast personal fortune of £340,000. Architecture expert Julian Orbach of Buildings of England, who visited Somerton Randle in September last year, thinks that his new manor house may have been designed by William Paty of Bristol (1758-1800), the architect and marble-mason who built No 7, Great George Street, Bristol (now the Georgian House Museum) for Pretor Pinney in 1789-91. The house at Somerton, described as ‘newly erected’ in 1789, was a large L-shaped building with a detached wash-house, stables and offices to the east. In 1845, William Pretor Pinney inherited his grandfather’s estate and, the following year, had the house substantially altered to its present form of two tall storeys with attics in grey lias ashlar stone, an imposing seven-bay garden front, and a new north entrance with a Tuscan portico of Ham stone and a Venetian window and pediment above. He also extended the house to the east, and, in about 1860, added a stable court with a striking entrance archway and ornate clock tower, possibly designed, Mr Orbach suggests, by leading Victorian architect Edward Buckton Lamb, who worked for Disraeli at Hughenden Manor, Buckinghamshire. Successive generations of Pretor Pinneys improved the estate. Somerton was a major staging post between London and the South-West, and road noise was a concern, so Pretor Pinney’s son, John Frederick, had the medieval route from Ilchester, which passed close to the manor’s northern boundary, diverted in stages between 1824 and 1845. He and his son William further expanded the estate by buying adjoining farms-Midney Farm in 1837 and Catsgore Farm in 1865. This being the Somerset Levels, the family also developed extensive land drainage and water courses around Somerton Randle. In 1962, the Pinneys sold the estate to the Vaughan-Lee family, who sold it, in turn, to current owner Peter Cropper and his wife, Dame Hilary Cropper, in 1998. One of Britain’s most dynamic entrepreneurs until her death from cancer in 2004, Dame Hilary joined her husband in the inspirational refurbishment and restoration of Somerton Randle, its buildings and 89 acres of gardens, woods and farmland. 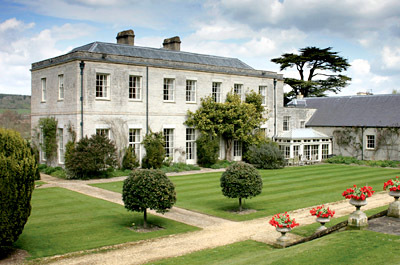 The 12,249sq ft Georgian house, listed Grade II, has six reception rooms, including an elegant drawing room with a George III Carrara marble fireplace, a large kitchen on two levels, a conservatory, a leisure wing, a grand staircase, 10 bedrooms and six bathrooms. Other listed period buildings include the six-bedroom coach house, three cottages, the stables and the original outbuildings. For sale on the open market ‘for the first time in living memory’ at a guide price of £6m through Knight Frank (01225 325999)-is the classic Georgian Crowe Hall, listed Grade II, on Widcombe Hill, Bath, whose 30 acres of grounds overlooking the city include 10 acres of 18th-century gardens. Built of Bath stone in about 1760 for the Crowe family, the hall was bought in 1804 by the Tugwells, who owned it for the next 115 years, during which time the house and gardens were substantially remodelled. was bought by Brigadier Maconochie, who made significant changes to the gardens, replacing Victorian parterres with lawns and a pond and creating a cascade to run through the existing Victorian grotto. Requisitioned by the Admiralty in the Second World War, the house was bought in 1961 by the chemist Sir Sydney Barratt of ‘Dambusters’ fame, who recreated its 18th-century ambience, filling its elegant rooms with furniture and paintings of the period. He left the hall to his son John, who spent his life restoring the house and tending the gardens. Following John Barratt’s recent death, Crowe Hall is now owned by his niece, Catherine Suckling, who, faced with the prospect of having to invest serious money to bring the house up to 21st-century standards, has decided to bow out, taking with her some wonderful childhood memories. Charlie Taylor of Knight Frank reports enquiries ‘flooding in from the UK and overseas’ for this remarkable stone manor house with its spectacular views over Bath’s 18th-century Prior Park, built by John Wood with gardens designed and laid out by Capability Brown. Crowe Hall has six grand reception rooms, a kitchen/breakfast room, 10 bedrooms, five bathrooms and a two-bedroom coach house.